WIN $25 GIFT CARD TO WAL-MART OR PAYPAL CASH! The Gift Card Giveaway Hop is hosted by Kathy at I Am A Reader Not A Writer and is Co-hosted by Mary from Sweeping Me, and it goes a little something like this: A bunch of blogs sign up to host a giveaway and then we link up together (using the Linky list below) which enables everyone who’s participating in the hop, as well as all of our collective followers, to visit each giveaway blog. This allows blogs to get new followers and followers to find new blogs! Everyone wins! 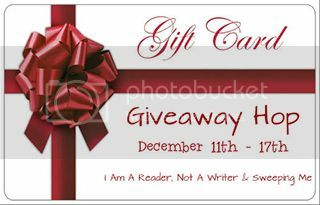 The Gift Card Giveaway Hop is scheduled from December 11th at 12:00 AM to December 17th at 11:59 PM. Don’t forget to hop on down the line and enter ALL the Gift Card Giveaways!